I download epub and pdf format books from the public library and a private bookseller. The download comes with a .acsm suffix instead of epub or pdf. When I try to transfer these to my Nook Color use ADE they are not accepted by ADE and do not show in the library window. If you do have Adobe Digital Editions installed and authorized correctly, then you won’t even see the .acsm file at all. It will do its job in the background of your ebook download. The purpose of this file is to communicate with Adobe’s content server and register the ebook to the Adobe ID that you have used to authorize ADE. If you don’t know how to do the authorization process, so you only remove drm from epub/pdf file, not from .acsm file, This is how to remove drm from epub/pdf file. ePub Converter is tools to convert Adobe digital editions DRM ebook to PDF ePub HTML Word Text format, it removes expired limitation of public library epub/PDF books, support Adobe ADE, NOOK DRM protection, support Google ebook, Kobo eBook, Sony eBook. 3). Run ePub Converter, it is easy to use, click “Digital Editions” button to import epub file from digital editions library folder. 4) Select output format, user can set paper size if output is PDF format, it support Letter, A4, A5, B4,B5 size, then Click “Convert” button to start job, it takes time to convert to other format, wait until job finished. 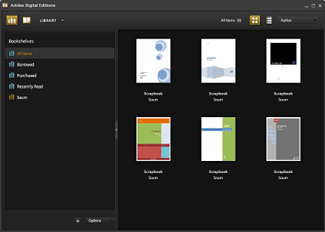 5) After you succeeded in converting EPUB to PDF, you can read your epub in any device. 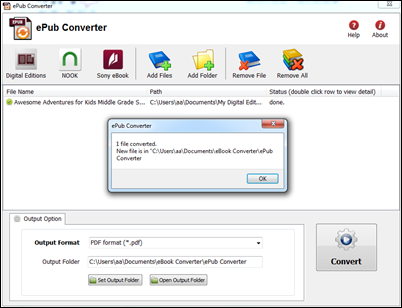 How to convert ePub to PDF AZW HTML RTF TXT format?